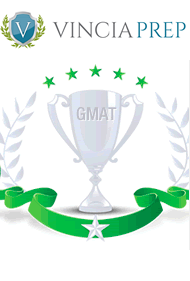 When I decided to apply for an MBA, I was a bit frightened by the GMAT. I first self-studied but could not get a better score that 480. Then I looked for a tutor, and found Dan thanks to this website. After we met for a couple of hours, I knew it would be of a great value for me. Dan's team provided me the necessary theoretical material covered by the GMAT and also the corresponding practical work. During each class we corrected my homework and my teacher helped me understand why I made the mistakes I made. Even in-between classes Dan was available by e-mail to help me when I did not understand a concept. Vincia's teachers are very supportive and patient, which I highly appreciated as the quantitative part gave me a hard time! Once all the concepts had been covered, Vincia offers some CATs, which allow you to easily see the how you can make improvement and your weakest points. Dan also analyzed the results and helped me improve my score by helping me with things like improving my time management. In the end, my score did finally improve. When I finally took the GMAT, I improved my score by 180 points, and I am sure I could not have scored so high without Dan and his team. After the GMAT, I decided to ask Dan if he could help me for the essays. I sent him my drafts and a few days later he provided me detailed feedbacks on how to improve. He did not write the essays on my behalf, but rather just helped me look deeper into why I wanted to pursue an MBA and help guide me in finding ideas. He helped me structure my work and make my essays more convincing. Once again, Dan was really supportive, patient, and available. So if you are serious about studying and enrolling in a MBA program, you should consider working with Dan! 4 months later... I recently received admissions from Boston University with a $20,500 scholarship per academic year, and from Boston College with a $15,500 scholarship per academic year! I am sure that without your support it would not have been possible! Hi Dan, I hope you are fine, I just wanted to let you know that I just recieved a decision from BC. My scholarship has been improved from $15,500 to $25,500 per year! Thank you again, especially for helping me make an additional $20,000! Whenever people ask me how I made it, I always tell them that it was thanks to you and your team. What I enjoyed the most while preparing with you was how you took at heart to be my coach in all aspects. It was an endurance race and you made sure that I could make it through the finishing line. Not only did you teach me about how to successfully take the GRE, you also paced the entire process. You challenged me to do better and to carefully plan in advance all aspects of my candidacy. I can't remember how many iterations of my schools essays we went through ;) quite an adventure indeed. Also, the few hours that I did for the TOEFL really helped. Funny that you've written just now! I was about to send you a mail. I get accepted at the IESE in Spain!!! I had the confirmation yesterday. Thank you very much for your help and support during these long months! It made the difference! I can't imagine going through the whole process of selection without your support. Even after scoring only 590 on the GMAT they decided to accept me in large part because of essays, CV, and letters of recommendation that we did together. Also, tell Rose thanks for all of her help on the TOEFL. In my case, her classes were a critical part of my 16 point increase and I definitely couldn’t obtain it without her help. Mission accomplished, thanks to Rose. Even though speaking in English was my biggest weakness on the TOEFL her tips and preparation really helped me speak with confidence. Hi! Took the GRE Nov. 20th and got a 166 Verbal and 150 Maths. I think my verbal score is very good, especially for a non-native speaker. Your reading comprehension class was particularly helpful. Anyway, I hope the admissions committees will be impressed by the verbal score- I’ll let you know how it turns out! I did get into the Harvard and I am actually in the States right now, starting classes tomorrow! If anyone asks where to prepare for the GRE, I will send them to you! I got a 750! Hell to the yeah. I got back a few hours ago, and I'm still on a cloud. I had time to spare on the verbal section; I think I just got really impatient with those questions. In any case, thanks for all of your help. Your advice really helped me break the 700 level barrier. You have done a terrific job going through all the Gmat available material, which allows your students to work efficiently and improve their scores tremendously in a small amount of time. Your methods and advice are very valuable and your math courses impeccable. Thank you very much for your help. Hi Dan, How are you? I just wanted to tell you I got into the program I wanted at MIT! I'm pretty excited about it, it should be very interesting! Thanks again for your help during the whole process, it was really differentiating. I'm not sure I would have made it without your advice during our last meeting. So I wanted to thank you for everything because the magic worked! I got 314 on the GRE: 157 in math and 157 on the verbal. Your lessons were really great and your humor really helped me get through what is usually an extremely dull subject for me. Dear Dan, Thank you so much for your help!! I received the offer from LSE and LBS a couple of weeks ago and I still cannot thank you enough for your great support during my application process. The GMAT was quite hard me, but you taught me lots of good tricks, and most importantly, you were able to give me a lot of "customized" advice that I would have never found in any other school. I think that you are truly meant to be a teacher, you are dedicated and very smart. In addition, you have an excellent knowledge of what schools are expecting from candidates. Your support truly helped me to gain self-confidence, and that for sure highly contributed to my success. Actually, to be honest, without you, I do not think that I would have had the great opportunity to go to LSE or LBS. since my GMAT score was a little low. However, I think that your help with the essays really helped me shine. So thank you very much for your help, support, and knowledge!! I am so grateful! Also, I will not hesitate to advertise your business to my friends and family located in France! I hope we can keep in touch and meet again in Paris soon!!! :-)) Anne-Hélène M.
I met Dan as I was looking for a GMAT teacher about a year ago. I had studied the GMAT on my own but I was making little progress. Before I started the classes my score was around 550, mainly because of pace problem; I had difficulties to finish the question bank. Dan helped me to learn tricks so I could get quicker at answering correctly the questions. We mainly focused on the Quant section which was was my weakest point. In the end I got a 650. I appreciated Dan’s flexibility to meet for classes, often in the evening, in order to fit my agenda. The classes really helped me to take off and realize what was going wrong in the way I was studying before. Later on I asked Dan to help me with my essays. We discussed my project and kept exchanging emails while my essays were slowly taking shape. I got the feeling Dan really captured my story, making constructive critiques and challenging me over and over. He also helped me with the editing as English is not my mother tongue. I applied to 4 schools: Columbia, NYU, Chicago Booth and Kellogg. I got accepted to NYU, Booth and Columbia. Overall I was very satisfied. Dan is someone intelligent, very professional and reliable. I would strongly recommend him as a teacher and a consultant for essay writing. The class was definitely helpful, and for my case, and to be honest, it was more about how to deal with the GMAT's type of questions, how to process and how to manage time more than learning mathematics that was useful to me. If we need to train more people here I’ll be sure to recommend you. I am very happy to hear from you! The test was good, i got 660 (82 percentile) after a 520 the first time. Your math classes were very helpful. Your good courses made a big difference in my score. Thank you very much for your help. Even after only a couple of sessions I felt the benefit of our meetings. The tricks that you taught me and the way to approach the exam came in handy on test day. I would be very pleased to see you again either in Paris or near Warwick were I am going to go to school. I just wanted to let you know that I just heard that I was accepted to the INSEAD EMBA programme! Thanks for all your help, I never could've gotten here alone! It’s hard to imagine that I went from the very basics in math to getting a score high enough that I could get into INSEAD!